There’s nothing like a hint from Mother Nature to show you that the cute, breezy apartment you moved into this summer is a drafty nightmare in the winter. So what’s the best way to seal out the cold air and finally be able to walk around your apartment without wearing four sweaters at a time? In short, focus on window insulation. A single pane of glass can lose nearly ten times as much heat as the same area of an insulated wall1—and depending on when your apartment was last remodeled, your heater might be working overtime trying to make up the difference. While you might not be able to convince your landlord to replace your windows altogether, window insulation is an easy way to keep your apartment warm and lower your utility costs. Window film creates an insulating barrier between the interior of your apartment and your windows. Kits typically include plastic shrink film that you apply to the indoor window frame using double-sided sticky tape. Simply heat the film with a hair dryer to shrink it and remove wrinkles. 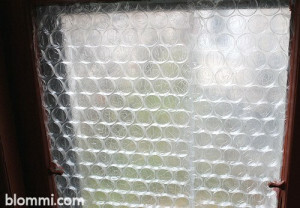 It may not look pretty, but bubble wrap is a great way to insulate your apartment windows. Simply spray a mist of water over the inside of your clean window and hold the bubble side of the bubble wrap to the wet window. Sealing the edges with tape may help keep heat in but can lift paint when removed. Removable magnetic window insulation is the perfect solution if you want to open your windows during the winter occasionally. Instead of tape, magnets hold the insulating vinyl in place so you can put the insulation in place on cold days, leaving it off otherwise. 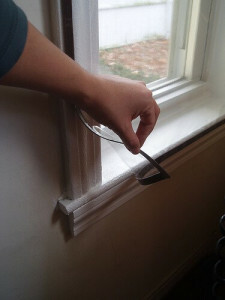 Simply apply several coats of magnetic paint to the window trim, measure and cut the vinyl to fit your window, and then attach magnetic tape to the vinyl. The magnetic tape will hold the vinyl to the magnetic paint, yet be easy to remove. 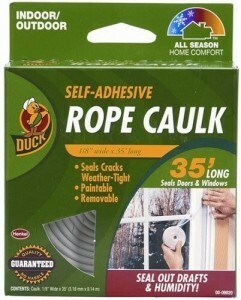 Rope caulk is a little like Silly Putty rolled out into a long rope that you can pull apart and jam into large gaps and spaces in your windows. Simply press the rope caulk inside the window cases along the edges. If you live in a ground-floor apartment, do the outside of the windows as well for extra insulation. Thermal curtains feature a special lining that holds warm air inside during the winter and blocks the heat during the summer. 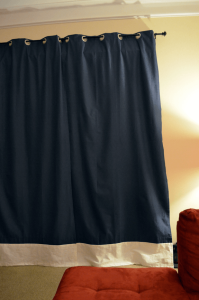 Thermal curtains also block out light and help reduce noise. Make sure your curtains cover your windows completely so they effectively insulate your apartment windows for winter. Do you have any additional tips for apartment window insulation in the winter? Let our readers know what’s worked for you in the comments below! 1. Ha, Tonya. The Australian Green Consumer Guide: Choosing Products for a Healthier Home, Planet and Bank Balance. Illustrated ed. Australia: UNSW Press, 2008. Google Books. Japanese use papers with thin wooden frame in window.